UPDATE: More details on Humax's Freeview HD+ recorder | What Hi-Fi? This will be done via Ethernet, although the company is looking into the possibility of offering a wireless dongle if there's sufficient demand. This streaming functionality won't be available at the time of launch though - a software update will be made available in the Autumn. Unlike many of the Freeview HD boxes and PVRs that are currently on the market – read our blog all about them here – where high-definition programmes are broadcast in digital surround, the HDR-FOX T2 can output DD5.1 over both its HDMI and optical digital outputs. Review samples are expected in a couple of weeks time, so keep your eyes peeled for our review. Humax will launch its first Freeview HD+ personal video recorder with 500GB hard drive in July at £349. The Humax HDR-FOX T2 allows users to pause, rewind, record and store high-definition content from the BBC, ITV, Channel 4 and S4C, plus up to 50 standard-definition channels from Freeview. The 500GB hard drive can store up to 125 hours of HD content, and there's an eight-day EPG (electronic programme guide) to make it easier to find and record shows. A USB port enables photos, videos and MP3 music files to be played directly on the the TV, while the Ethernet connection means the HDR-FOX T2 can be connected to the web and a home network. Humax introduced its (non-recording) HD-FOX T2 Freeview HD set-top box in February for £170. 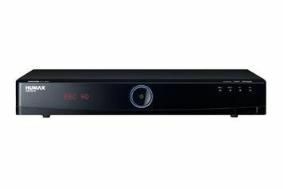 Numerous other manufacturers, including Philips, Sharp, Toshiba, Digital Stream, 3View and Sagemcom, have also announced plans to release Freeview HD receivers and PVRs, as you can read here.